This paper sought to identify whether, in fact, for corn “the nation-wide data . . . in the United States do not show a significant signature of genetic-engineering technology on the rate of yield increase,” as was indicated by NASEM (2016). Using corn yield panel data corresponding to roughly 28,000 U.S. county-years before and after adoption of GE corn, a simple model only including a time trend confirms NASEM’s assertion, as the effect of GE adoption appears, if anything, to have had a negative effect on yields. However, subsequent analysis reveals this simple model is biased. After controlling for weather and soil characteristics, and assuming a homogeneous effect of adoption, we find that adoption of GE corn has led to an approximate 17 percent increase in corn yields. We also find significant heterogeneity in the yield-effect that is not related to state-boundaries but rather to soil characteristics. On average, adoption of GE corn has led to an 18.5 bushel per acre increase in yield, but the effects range from 12.5 to 25.1 bushels per acre depending on soil characteristics. We conjecture that the variation across soil types may be related to differences in insect pressure. While we found important soil-GE adoption interactions, there were no significant interactions related to weather. The findings suggest that the current GE traits have not led to more resilience to heat or water stresses. Moreover, while we find that the variance in corn yield has increased over time, adoption of GE corn has not lowered the variance. Nonetheless, if as our results show, adoption of GE corn increases yield without affecting variance, the coefficient of variation on yields has fallen as a result of GE corn adoption. This suggests GE corn is less risky as, for example, the actuarially fair price of insurance to indemnify a given yield falls as the coefficient of variation falls (pgs. 21-22). So, once again, maybe we should calm down about GMOs. What about “superweeds”? Again, the evolution of resistance by weeds to herbicides is nothing new and is certainly not a problem specifically related to genetically enhanced crops. As of April 2014, the International Survey of Herbicide Resistant Weeds reports that there are currently 429 uniquely evolved cases of herbicide resistant weeds globally involving 234 different species. Weeds have evolved resistance to 22 of the 25 known herbicide sites of action and to 154 different herbicides. Herbicide resistant weeds have been reported in 81 crops in sixty-five countries. A preliminary analysis by University of Wyoming weed scientist Andrew Kniss parses the data on herbicide resistance from 1986 to 2012. He finds no increase in the rate at which weeds become resistant to herbicides after biotech crops were introduced in 1996. Since Roundup (glyphosate) is the most popular herbicide used with biotech crops, have the number of weed species resistant to Roundup increased? Kniss finds that the development of Roundup resistant weeds has occurred more frequently among non biotech crops. Glyphosate resistant weeds evolved due to glyphosate use, not directly due to GM crops,” he points out. “Herbicide resistant weed development is not a GMO problem, it is a herbicide problem (pgs. 155-156). The more you learn about herbicide resistance, the more you come to understand how complicated the truth about GMOs is. First you discover that they aren’t evil. Then you learn that they aren’t perfectly innocent. Then you realize that nothing is perfectly innocent. Pesticide vs. pesticide, technology vs. technology, risk vs. risk—it’s all relative. The best you can do is measure each practice against the alternatives. The least you can do is look past a three-letter label. Last year, I wrote about an Oklahoma State University survey indicating that over 80 percent of Americans support “mandatory labels on foods containing DNA.” A new study written by economists Brandon McFadden and Jayson Lusk (who also helped author the OSU survey) similarly finds that 80% of the public support labeling of foods containing DNA (though in this case the question does not clearly indicate whether the labeling should be mandatory or not). Katherine Mangu-Ward has some additional discussion of the study here. Obviously, such DNA labels would be absurd. Nearly all food contains DNA, and there is no good reason to warn consumers about its presence. As McFadden and Lusk and explain, the survey answers on this subject are an indication of widespread scientific ignorance, proving that many of the respondents “have little knowledge of basic genetics.” Other data from the study also support this conclusion, including the fact that 33 percent of respondents believe that non-GMO tomatoes do not contain any genes, and 32 percent think that vegetables have no DNA. Our vegetables would be blissfully free of DNA if not for the nefarious corporations who maliciously insert it into the food supply! The authors note that the proportion of respondents who support labeling of foods containing DNA is very similar to the percentage who support mandatory labeling of GMO foods (84 percent). Given our previous posts on GMOs here at Difficult Run, you can imagine that I wasn’t too thrilled about this information. Opposing GMOs is a first world luxury. 40% of children under 5 in the developing world have vitamin A deficiency, which is a leading cause of childhiood blindness and death. We could prevent up to 2 million deaths per year if we could increase access to Vitamin A.
GMO crop golden rice is genetically designed to provide vitamin A. Since rice is an inexpensive staple crop for much of the world, this has a lot of promise. And yet anti-GMO protesters, including Greanpeace, are trying to block the use of golden rice, even destroying research crops. I guess they have a point. We wouldn’t want to feed children anything “unnatural.” Better to let them suffer natural handicaps and die natural deaths. 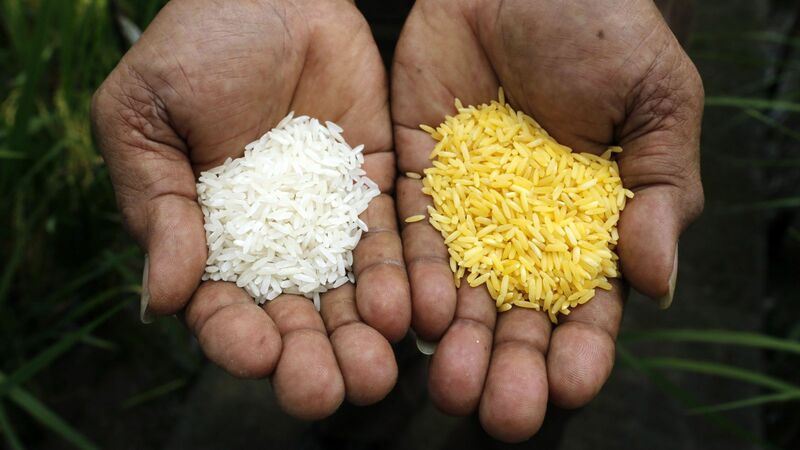 Golden rice was possible only with genetic engineering. The crop was stalled for more than ten years by the working conditions and requirements demanded by regulations…For example, we lost more than two years for the permission to test golden rice in the field and more than four years in collecting data for a regulatory dossier that would satisfy any national biosafety authority. I therefore hold the regulation of genetic engineering responsible for the death and blindness of thousands of children and young mothers. In 2012, a new tool was invented that revolutionizes how scientists can examine—and manipulate—plant genetic processes. It’s called CRISPR-Cas9, and unlike its predecessors in the world of genetic modification, it is highly specific, allowing scientists to zero in on a single gene and turn it on or off, remove it or exchange it for a different gene. Early signs suggest this tool will be an F-16 jet fighter compared with the Stone Age spear of grafting, the traditional, painstaking means of breeding a new plant hybrid. Biologists and geneticists are confident it can help them build a second Green Revolution—if we’ll let them. …The process can easily modify plant DNA without changing the plant’s essence—except to make it tastier, more nutritious, quicker to market, easier to ship, machine-pickable, less needy of water and/or able to flourish in a heat wave. And we can do it for big companies and small, the world at large and isolated communities…In the old days, relying on hit-or-miss natural processes to breed plants took many years. Norman Borlaug, father of the first Green Revolution—a hugely successful effort to improve food-crop productivity in poor countries that began in the 1940s and eventually doubled or even quadrupled what many plants could produce—needed almost two decades to create a better wheat variety. With CRISPR-Cas9, we can compress that development cycle to a few days or weeks. The article ends with a quote from Gengyun Zhang, head of life sciences for BGI (China’s giant state-sponsored genetic engineering center): “With today’s technology, I have no doubt that we can feed the world.” Considering that the number of scientists who think GMOs are safe is slightly higher than those who think climate change is mostly due to human activity, perhaps we should give science a chance and activists the cold shoulder. I stand by my assertions that although you can know what happens to any individual species that you modify, you cannot be certain what will happen to the ecosystem. Also, we have a strange situation where we have malnourished fat people. It’s not that we need more food. It’s that we need to manage our food system better. So when corporations seek government funding for genetic modification of food sources, I stroke my chin. Yet even though I’m in favor of GMOs, I think he’s perfectly fine signalling caution about the difficulty of studying cause/effect within whole ecosystems and potential political/corporate interests in science. As scientists and engineers, we should always be questioning how our theories and models can be inaccurate or inadequate, and as human beings, we should always be wary of outside influences on science. Yet by Bill Nye’s own standards, he’s a denier. There are no studies to indicate environmental problems with GMOs, and if the amount of corporate and political influence in GMOs worries Bill Nye, he should be equally suspicious about climate change. Scientific theories…are not inductively inferred from experience, nor is scientific experimentation carried out with a view to verifying or finally establishing the truth of theories; rather, all knowledge is provisional, conjectural, hypothetical—we can never finally prove our scientific theories, we can merely (provisionally) confirm or (conclusively) refute them; hence at any given time we have to choose between the potentially infinite number of theories which will explain the set of phenomena under investigation. Faced with this choice, we can only eliminate those theories which are demonstrably false, and rationally choose between the remaining, unfalsified theories. Hence Popper’s emphasis on the importance of the critical spirit to science—for him critical thinking is the very essence of rationality. For it is only by critical thought that we can eliminate false theories, and determine which of the remaining theories is the best available one, in the sense of possessing the highest level of explanatory force and predictive power. I suppose people will now want to know what I believe about climate change, or conversely, if I say nothing people will probably start assuming. I know the earth is warming up. That’s not very hard to measure. I know that humans contribute to that warming. Again, not very hard to measure nor controversial. I do not know, though, to what extent humans contribute to the warming, nor to what extent reducing our greenhouse gas output a reasonable amount would actually slow this warming. That’s where the science of the matter gets difficult, because now we’re dealing with a whole ecosystem (like with GMOs), and sussing out cause and effect in a whole ecosystem is tricky. So currently, I have no strong opinion one way or the other. We could be contributing greatly to warming. Or our input could be modest. Modeling these effects and predicting warming rates is finicky to say the least. Then when we get to the politics and economics of global warming, the situation is even messier. Will carbon taxes actually reduce greenhouse gas output in any significant amount worth the economic costs? Can we even reduce our greenhouse gas output any appreciable amount that won’t send the American public into shock? This is where global warming gets beyond my expertise. So generally I just support measures that benefit us anyways with the side effect of combating greenhouse gas output. I support monitoring and regulating pollution output. I support continuing research into alternative energy sources, which isn’t just solar and wind for the record. We have geothermal, hydroelectric, wave energy, biomass, and more. I realize many of these methods are limited in their production capacity, location, and reliability, but they are capable of producing power amounts that aren’t insignificant. More importantly, I support nuclear power, which has none of the above limitations. Now this is where all the talk about supporting science gets really odd. Nuclear power plants have a very good safety record (despite what the news says), and engineers are constantly working to make them better. On top of that, add the context of nuclear safety versus other sources of power. On top of that, add some perspective on radiation amounts (yes I cited XKCD). On top of that, add the oft cited dire effects of global warming. In that context, how can opposing nuclear power be anything short of anti-scientific and ridiculous, using the vocabulary abundant in discussion of global warming? And yet, people do it. Many climate scientists are jumping on board the nuclear train, but there’s still plenty of opposition. People proclaim the inviolability of scientific consensus in one context and then turn around to challenge it in a different context. So, what general principles can we derive from this long-winded analysis? I would say people need to be able to simultaneously hold two seemingly contradictory concepts in their mind: Science is a quest for understanding the natural world, and science can never finally prove anything. With that knowledge, we should respect the explanatory power of science but also realize that science relies fundamentally on a critical spirit. We cannot crush dissent, nor should set ourselves up as arbiters of what constitutes “valid” dissent, which is really just crushing dissent by a different name. Rather, we must continually attempt to falsify our own theories, and if they survive the continuing ordeals, we can begin to call them well attested. But even then we must not close our minds, even as we defend theories we believe to be well attested. Newtonian physics reigned 300 years before general relativity showed up. How do these principles look practically? I would say they manifest themselves in simultaneously laying down what we know while maintaining a spirit of humility. For example, I have defended evolution numerous times contra creationism. I don’t resort to telling people they’re scientifically illiterate (even though people who try to tell a chemical engineer how the 2nd law of thermodynamics “actually” works might qualify). I don’t demand they accept the consensus of science over their doubts (which would be horrifically anti-scientific). Rather, I just tell them what I know and demonstrate the explanatory power of evolution. You’d be surprised how well that works. Even if people don’t change their minds right then and there, it gets their minds thinking, and it allays their fears that I have an ulterior motive for defending evolution. I believe these principles would serve science advocacy well. There is no contradiction between lacking absolute certainty and seeking scientific knowledge. In fact, the two work together. By realizing our own limitations, we can continually revise our understanding to better reflect what we see and what we know of the natural world. To say that we have finally and definitively figured out the answers ends the scientific quest and permanently extinguishes the scientific spirit.